What are your favorite children’s picture books? Are they books you remember from your childhood? Are they books you read to your kids? Picture books, maybe more than any other literary genre, call up fond memories. Sharing a picture book with your parents or with your kids–it’s more than just a book. It’s an experience, something that is part of your family. Mem Fox says that one of the most important things to remember when writing is that “child in the lap” moment. Book should enhance the parent-child/adult-child relationship in some way. It should make the child turn around and give you a hug. Or maybe it evokes a shared sense of wonder at a true story. it’s the sharing that matters. 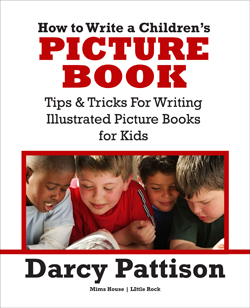 Writing a picture book with the “child in the lap” is just one of the many things I’ve included in my book, How to Write a Children’s Picture Book. It’s now updated with a new chapter on metafiction! And this popular ebook is now available as a paperback book. The workbook section at the end encourages you to actually work on those drafts! Read the SLATE Editor’s attempts at writing a Children’s picture book. I think they would have benefitted from a quick read of this book! How Do I Find an Editor’s Name for Submission?